Escape the urban bustle at Roebuck Bay and Dolphin & Whale Watching. Do some cultural sightseeing at Catholic Diocese of Broome and Broome Gallery. Spend the 26th (Thu) wandering through the wild on a nature and wildlife tour. The adventure continues: stroll the grounds of Japanese Cemetery, explore the galleries of Short St Gallery, examine the collection at SSJG Heritage Centre, and look for all kinds of wild species at Malcolm Douglas Crocodile Park and Animal Refuge. To see more things to do, traveler tips, and other tourist information, read Broome itinerary planning site . Berlin, Germany to Broome is an approximately 24-hour flight. You can also do a combination of train and flight. Traveling from Berlin to Broome, you'll lose 7 hours due to the time zone difference. In September, daytime highs in Broome are 38°C, while nighttime lows are 21°C. Finish your sightseeing early on the 28th (Sat) so you can travel to Kununurra. Waringarri Aboriginal Arts and Artopia Kununurra will appeal to museum buffs. Artlandish Aboriginal Art Gallery and Birdland Functional Art are good opportunities to explore the local culture. Spend the 30th (Mon) exploring nature at Mirima National Park. Spend the 2nd (Wed) exploring nature at Mitchell River National Park. And it doesn't end there: take in breathtaking views at Emma Gorge, get engrossed in the history at Kununurra Museum, don't miss a visit to Ivanhoe Crossing, and look for all kinds of wild species at Kangaroo Haven. Plan my day in Kununurra using traveler tips and tourist information provided by Inspirock. Fly from Broome to Kununurra in 1.5 hours. Alternatively, you can drive; or take a bus. Expect somewhat warmer weather when traveling from Broome in September: highs in Kununurra hover around 43°C, while lows dip to 20°C. Wrap up your sightseeing on the 4th (Fri) to allow time to travel to Geraldton. Geraldton is a coastal city in the Mid West region of Western Australia, located 424km north of Perth.At June 2015 Geraldton had an estimated urban population of 39,825. Appreciate the collections at Museum of Geraldton and Monsignor Hawes Heritage Centre. Step out of the city life by going to Town Beach and Coalseam Conservation Park. Change things up with these side-trips from Geraldton: South Beach (in Port Denison), Oakabella Homestead, Tea Rooms and Campground (in Northampton) and Our Lady of Mt Carmel Church (in Mullewa). There's lots more to do: contemplate the long history of Central Greenough, take in the architecture and atmosphere at St Francis Xavier Cathedral, identify plant and animal life at Waminda Wildlife Sanctuary, and explore the galleries of Geraldton Regional Art Gallery. Planning Geraldton trip won't be overwheling when you use's Insprock itinerary maker. Fly from Kununurra to Geraldton in 7 hours. Alternatively, you can drive; or take a bus. When traveling from Kununurra in October, plan for much colder days in Geraldton, with highs around 30°C, while nights are a bit cooler with lows around 13°C. Cap off your sightseeing on the 9th (Wed) early enough to go by car to Kalbarri. Visiting Kayaking & Canoeing and Murchison River will get you outdoors. Your itinerary includes some good beach time at Chinaman's Beach and Pot Alley Beach. And it doesn't end there: explore the striking landscape at Nature’s Window, tour the pleasant surroundings at Ross Graham Lookout, see the vivid underwater world at Blue Holes, and get great views at The Loop and Z Bend Gorge. For reviews, ratings, and more tourist information, read Kalbarri online day trip planner . Drive from Geraldton to Kalbarri in 2 hours. Alternatively, you can do a combination of bus and taxi. Cap off your sightseeing on the 15th (Tue) early enough to go by car to Denham. Denham is the administrative town for the Shire of Shark Bay, Western Australia. 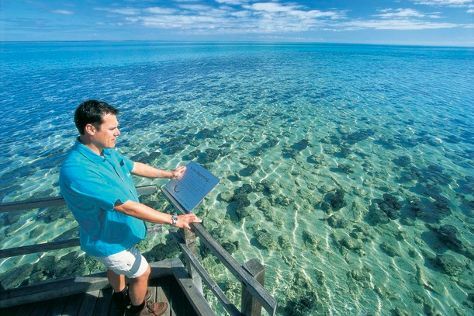 You'll discover tucked-away gems like Francois Peron National Park and Hamelin Pool Stromatolites. 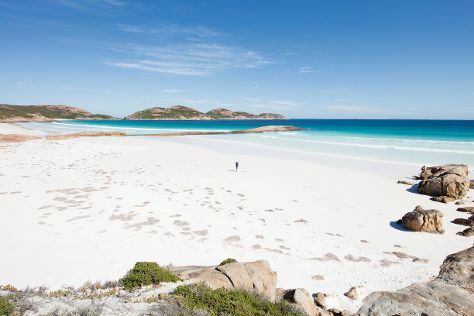 We've included these beaches for you: Shark Bay and Shell Beach. The adventure continues: meet the residents at Ocean Park Aquarium. For maps, where to stay, and other tourist information, read Denham road trip planning site . You can drive from Kalbarri to Denham in 5 hours. Alternatively, you can do a combination of bus and shuttle. Finish up your sightseeing early on the 18th (Fri) so you can go by car to Exmouth. Exmouth is a town on the tip of the North West Cape in Western Australia. Visit Ningaloo Coast World Heritage Area and Mauritius Beach for some beach relaxation. Explore hidden gems such as Ningaloo Marine Park and Ningaloo Reef. Spend the 24th (Thu) exploring nature at Mandu Mandu Gorge. 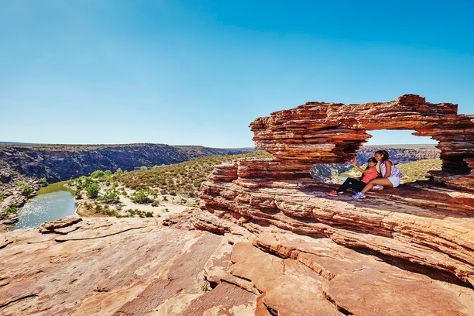 There's much more to do: explore the stunning scenery at Charles Knife Canyon, take a memorable drive along Cape Range National Park, take your sightseeing to a higher altitude at Shothole Canyon, and see exotic creatures in open habitats at a safari tour. To find maps and more tourist information, read our Exmouth road trip planner. You can drive from Denham to Exmouth in 8 hours. Other options are to do a combination of car and bus; or fly. In October, plan for daily highs up to 39°C, and evening lows to 19°C. Wrap up your sightseeing on the 26th (Sat) early enough to travel to Esperance. Esperance is a town in the Goldfields-Esperance region of Western Australia, on the Southern Ocean coastline approximately 720km east-southeast of the state capital, Perth. You'll explore the less-touristy side of things at Twilight Bay and Lucky Bay. You'll explore and learn at Esperance Museum and Cindy Poole Glass Gallery. Spend the 31st (Thu) exploring nature at Cape Le Grand National Park. And it doesn't end there: cruise along Great Ocean Drive, don't miss a visit to Esperance Whale Tail, look for all kinds of wild species at Lake Monjingup Conservation and Recreation Area, and head off the coast to Woody Island. For traveler tips, ratings, and more tourist information, refer to the Esperance day trip planning tool . Traveling by flight from Exmouth to Esperance takes 6.5 hours. Alternatively, you can do a combination of flight and bus; or drive. Traveling from Exmouth in October, expect Esperance to be little chillier, temps between 26°C and 11°C. Finish up your sightseeing early on the 31st (Thu) so you can go by car to Kalgoorlie-Boulder. Get in touch with nature at Goongarrie National Park and Red Hill Lookout. Hannans North Tourist Mine and Goldfields Arts Centre will appeal to museum buffs. Take a break from Kalgoorlie-Boulder with a short trip to Warden Finnerty's Residence in Coolgardie, about 42 minutes away. For maps, traveler tips, photos, and other tourist information, refer to the Kalgoorlie-Boulder day trip planning site . You can drive from Esperance to Kalgoorlie-Boulder in 5 hours. Another option is to take a bus. Traveling from Esperance in October, expect nights in Kalgoorlie-Boulder to be about the same, around 15°C, while days are a bit warmer, around 33°C. Finish your sightseeing early on the 5th (Tue) so you can travel to Albany. Visit Princess Royal Fortress and The Albany Convict Gaol & Museum for their historical value. You'll explore and learn at Torbay Glass Studio and Vancouver Arts Centre. You'll find plenty of places to visit near Albany: Bluff Knoll (in Stirling Range National Park), Walpole (Giant Tingle Tree & Walpole-Nornalup National Park) and Waychinicup National Park (in Cheynes). Spend the 7th (Thu) observing fascinating marine mammals with a dolphin and whale watching tour. Next up on the itinerary: kick back and relax at Emu Point, pause for some photo ops at Desert Mounted Corps Memorial, explore and take pictures at Replica of the Brig Amity, and stroll through Little Beach. For other places to visit, maps, reviews, and more tourist information, read Albany online trip maker . Fly from Kalgoorlie-Boulder to Albany in 5.5 hours. Alternatively, you can drive; or do a combination of bus and flight. In November, Albany is little chillier than Kalgoorlie-Boulder - with highs of 25°C and lows of 12°C. Finish your sightseeing early on the 12th (Tue) so you can drive to Margaret River. Get some cultural insight at Cape Grace Wines and Brookland Valley Vineyard. 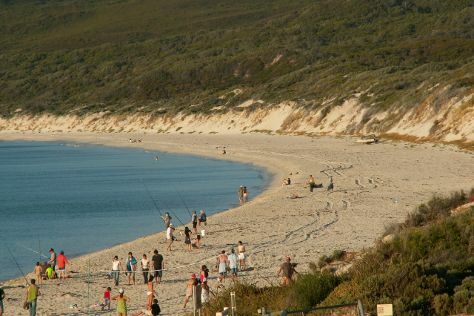 Get outdoors at Surfers Point and Yallingup Beach. Explore the numerous day-trip ideas around Margaret River: Dolphin & Whale Watching (in Busselton), Canal Rocks (in Yallingup) and Meelup Beach (in Dunsborough). There's much more to do: take in the dramatic natural features at Sugarloaf Rock, identify plant and animal life at Eagles Heritage Wildlife Centre, learn about winemaking at Howard Park - Margaret River Winery and Cellar Door, and enjoy the sand and surf at Margaret River Mouth Beach. For photos, maps, reviews, and other tourist information, read Margaret River trip itinerary app . Drive from Albany to Margaret River in 4.5 hours. Alternatively, you can take a bus; or do a combination of flight and bus. Finish up your sightseeing early on the 18th (Mon) so you can travel back home.